For its Celebrating Age project, Hat Fair in Winchester has commissioned exciting new theatre and film with older people to share their stories with wider audiences in a range of ways. So here we are. The King Charles Room at Winchester Guildhall is looking suitably Christmassy for December and has also acquired for one weekend gloriously up-lit shades of a classic Picture Palace. The screen is waiting, as is a live orchestra featuring local teenage musicians from Winnall Rock School and professional silent film accompanist Jonathan Best. Mince pies and popcorn are being served. An exhibition showcases various artefacts and video stories which people can listen into via headphones. 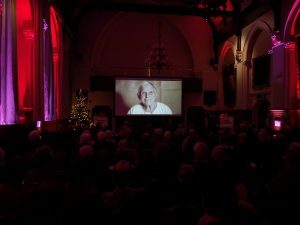 A packed crowd arrives for the Saturday evening premiere of THE RECYCLED SILENT MOVIE – Hat Fair’s final Celebrating Age project, funded by Arts Council England and the Baring Foundation, a remarkable year and a half of discovery, new friendships, partnerships and sheer joy in humanity. A remarkable year and a half of discovery, new friendships, partnerships and sheer joy in humanity. The film (made by SDNA with writer Richard Hurford and producer Amy Pendry) starts with a triumphant musical flourish reminiscent of Hollywood golden era classic movies. Over the next 24 minutes we are treated to an incredibly rich mix of recycled archive footage – hence the title of the project – mixed with new material telling the story of older citizens of Winchester and Corby (The Core at Corby Cube are our project partners) selecting treasured items to put in a gift box to send to their partners. These items reveal extraordinary memories of love, war-time engineering endeavour, faith, play and family. The film reaches its climax in front of an audience of participants, their families, interested members of the public, and artists who have worked on the process. After the film, the audience can view these items – now imbued with extra value having seen the true worth to their owners. It is down to me to say a few words of thanks afterwards. The film – and what it represents – has profoundly moved me and I initially find it humbling to speak. For this project has simply been extraordinary for Hat Fair and all of us associated with it. We started in Autumn 2017 with a rural tour to village halls and arts centres of FOURSCORE YEARS AND TEN – a theatre production originally commissioned by Winchester City Council and Hat Fair from the fabulous Flintlock Theatre. Set around tea party tables, the audience was treated to intimate true stories of six older people. All of the spoken text was carefully edited from actual interviews, and performed by younger actors, inviting us to hear these stories in a different way. The next stage of the project, building our contacts with older people in Winchester and Corby was THE LIVING PORTRAITS. We now have a fantastic collection of sixteen video ‘portraits’ exploring many facets of older people’s lives and their reflections on the past, present and future. With a mix of men and women from a wide range of backgrounds, both the Living Portraits and the Recycled Silent Movie, with a specially recorded score, will be available to further audiences as online pieces of art. These will accompany a final evaluation video which will capture facets of our journey. The impact of Celebrating Age on Hat Fair has been immense with older people a core part of our programme and audience development. I hope to find funding to continue and develop this vital and much needed work. But in the meantime, thank you to the Baring Foundation and thanks to Amy, Chanele, Rose, Richard, Valentina, Ben, Jonathan, Howard, Anna, Robin and all the participants, actors, artists, partners, students and colleagues along the way who have made the work such an inspiring joy. Andrew Loretto is the Director of Hat Fair. Celebrating Age is a joint Baring Foundation / Arts Council England fund for creative ageing. Hatfair’s Engagement Producer, Amy Pendry, has blogged about the Celebrating Age projects throughout the process. Kent-based Moving Memory is using its Celebrating Age grant to develop intergenerational dance performances and to engage older people living with mental health issues in dance. Wolverhampton Art Gallery's Still Lively hubs are helping local residents to discover or rediscover the joy of the visuals arts. Rural Arts are offering myriad arts activities in the community, at home and even on buses to help reduce rural isolation among older people in North Yorks. Older residents on the Isle of Wight are creating art from tapestry to sculpture with Independent Arts' Time & Tide Project.